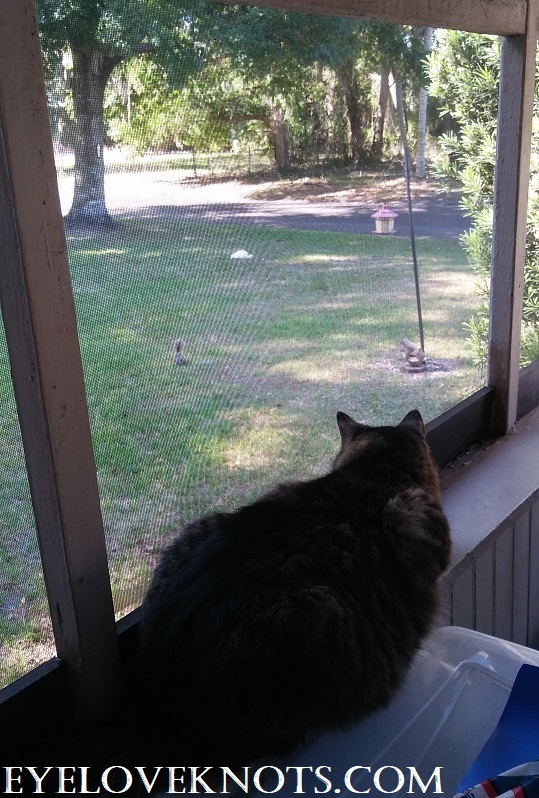 Today, I am sharing something special to me – a little bit about the wild birds (and squirrels) that come to my yard! 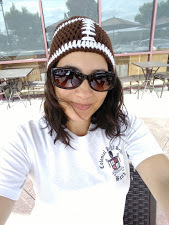 Today is my birthday! 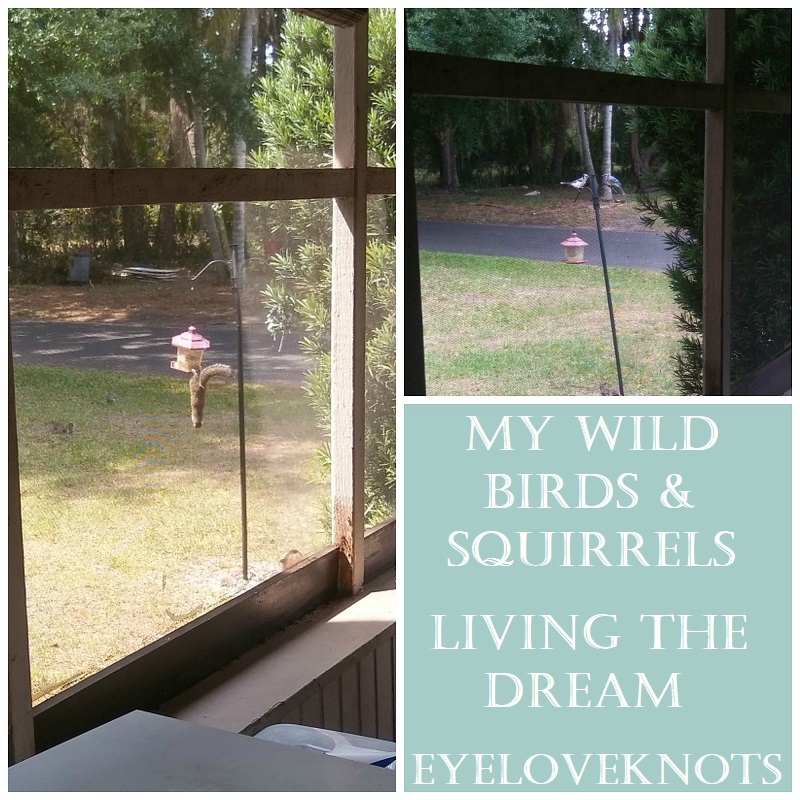 And so I wanted to share a special post with you about my wild birds and squirrels – something that I really love! 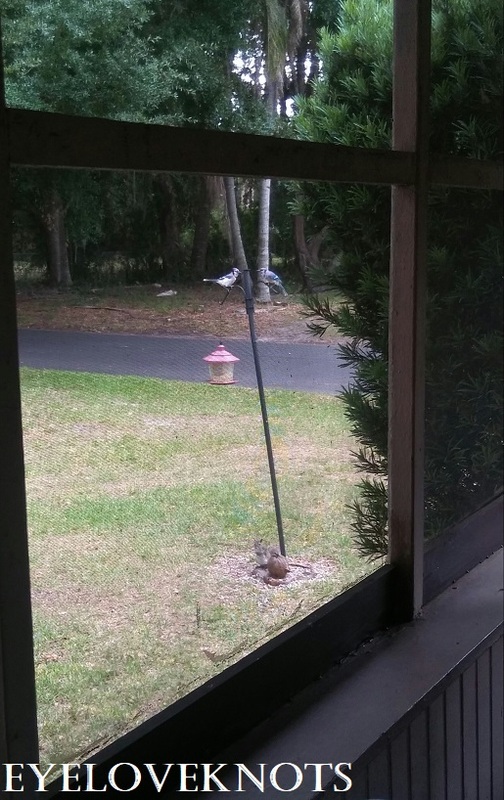 Before I get started, I live in Florida, and keep my feeder out all year because the birds and squirrels are pretty much out all year. 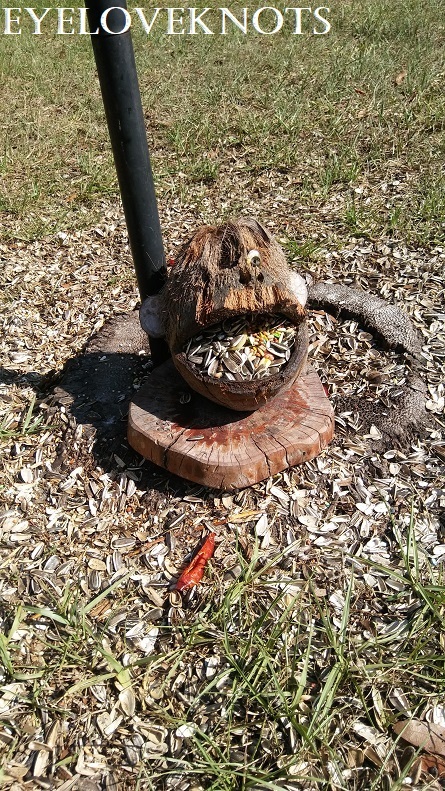 If you put it out at all, the birds and squirrels will learn they can always come there to get food, and by taking it away, you are taking that away from them. 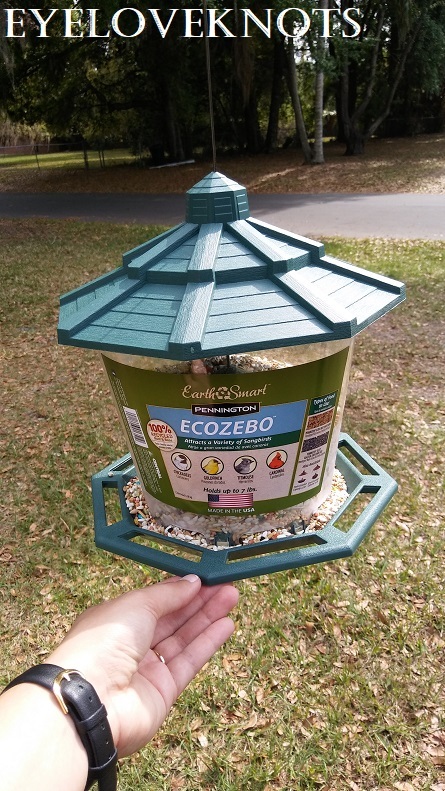 Also note, that it is best to set up a bird feeder near a bush or tree because the birds like to be able to hide in the bush or tree first to make sure it is safe for them. 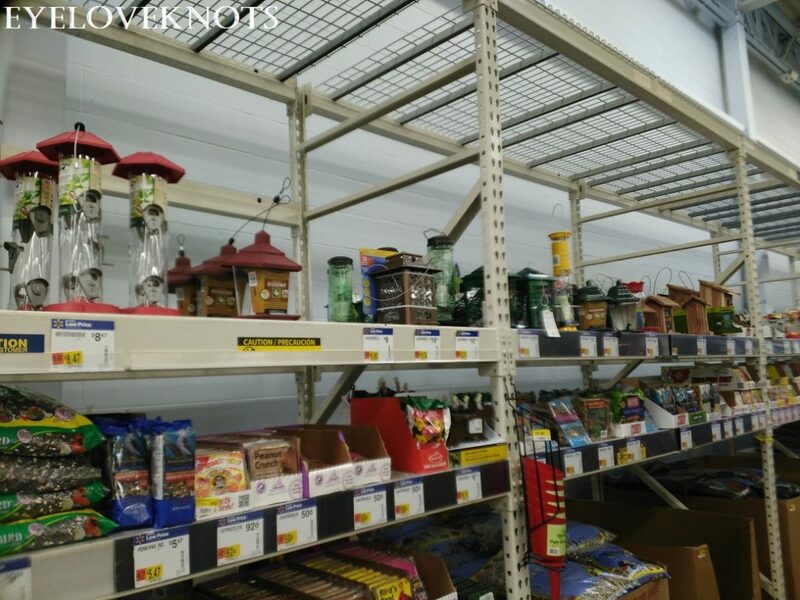 Back in April of 2017, I purchased a Kaytee 5′ Feeder Pole and Hanger from a local bird store, and some wild bird seed, then stopped at Walmart to pick up a bird feeder. 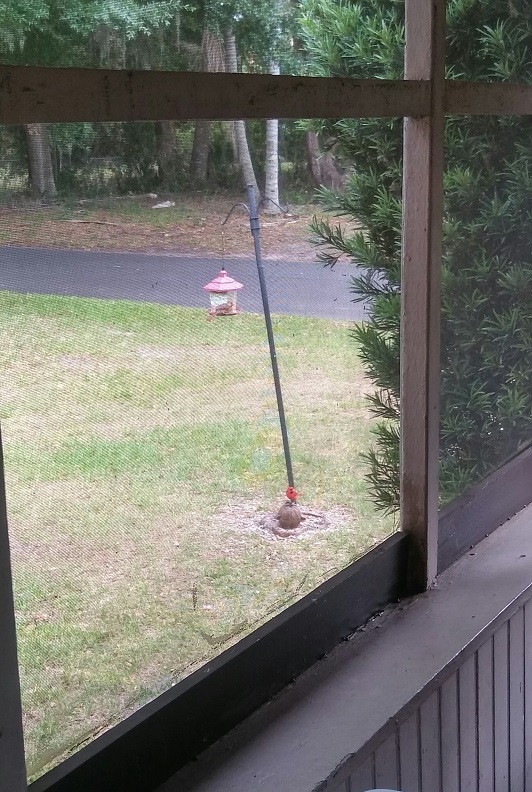 I got home, had Todd hammer the pole into the ground – NOTE, hammer in the bottom piece first, then attach the top because we split the pole a little by doing it as one piece, then set up my feeder. This Spring, I went back, and bought the larger one. 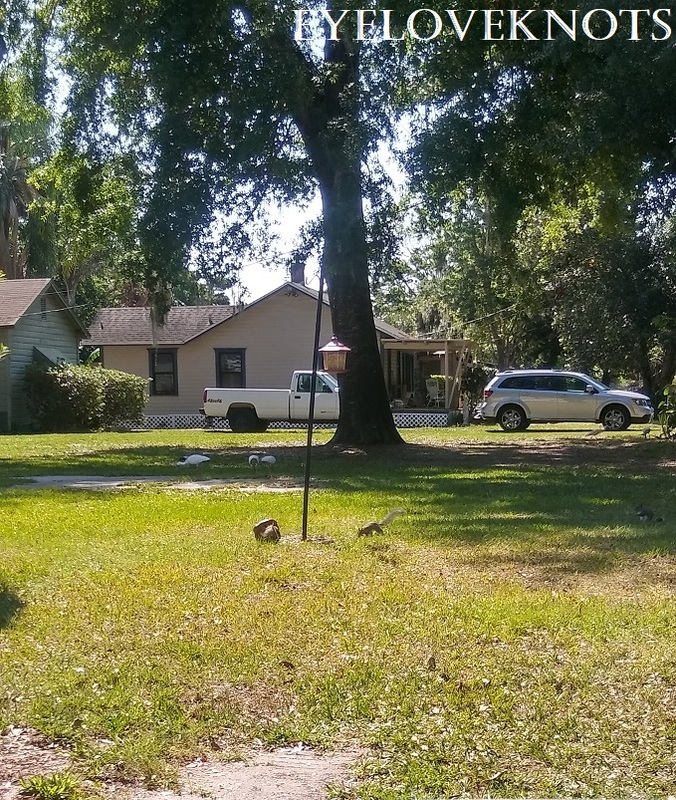 Since I no longer shop at said bird store, I now order my bird food online from a supplier I found at a local bird show, and the new food I use for the wild birds is Independent’s Choice Feed Fortified Cockatiel Seed. At a local store, Parakeet or Cockatiel will work. I go with the Cockatiel because it has shelled sunflower seeds. 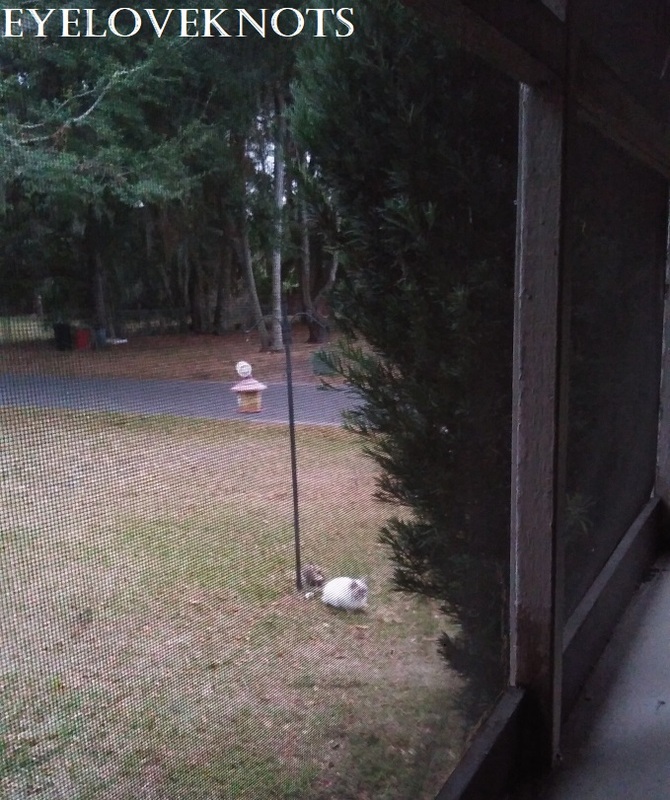 I get a lot of different types of birds to visit my feeder (more than photographed), but a couple months ago, while the birds were hiding (in the cold part of our Winter), I found a little white cat eating my bird food – community feeder, hehe. 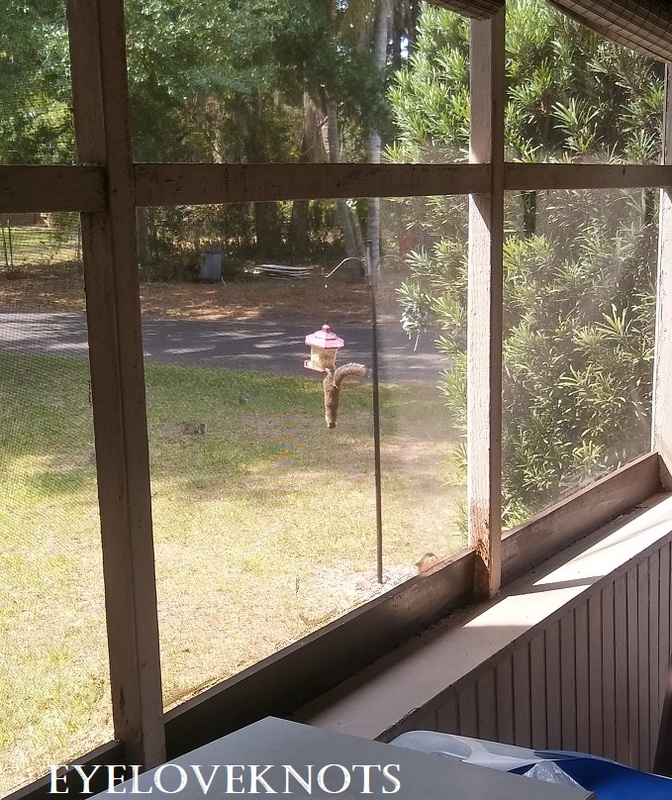 As soon as I put my bird feeder up, I realized that the squirrels were climbing my pole to eat the food, so I went and bought this monkey head from a local bird store (it’s a toy), and I use this to feed the squirrels. Inside is a generic parrot food. The new food I use for the squirrels is Independent’s Choice Feed Fortified Parrot Seed. I like this one because it has fruit pieces in it too. The squirrels don’t like the safflower seeds (the small white ones) or the Oat Groats (flat brown ones), but the Doves love these, and they will eat after the squirrels. When the monkey head is empty, the squirrels get upset – you can see here they’ve turned it over. I try to fill it every morning. Usually it’s pretty good for the day. If I forget, the squirrels climb the pole, and go after my bird feeder. I know this can be extremely frustrating, but do not use auto grease (or similar) on the pole. Yes, it works, but it is also toxic to the squirrels. Use a non-toxic method. Shiloh gets excited watching the birds and squirrels. 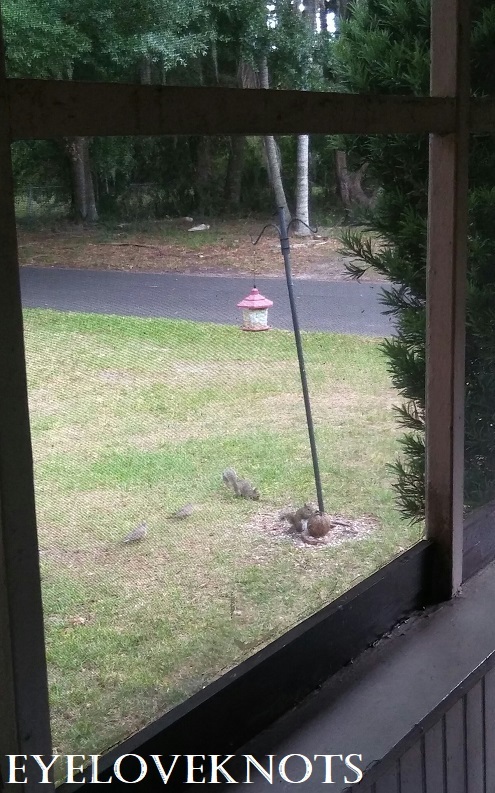 Here you can see some Doves with the squirrels. 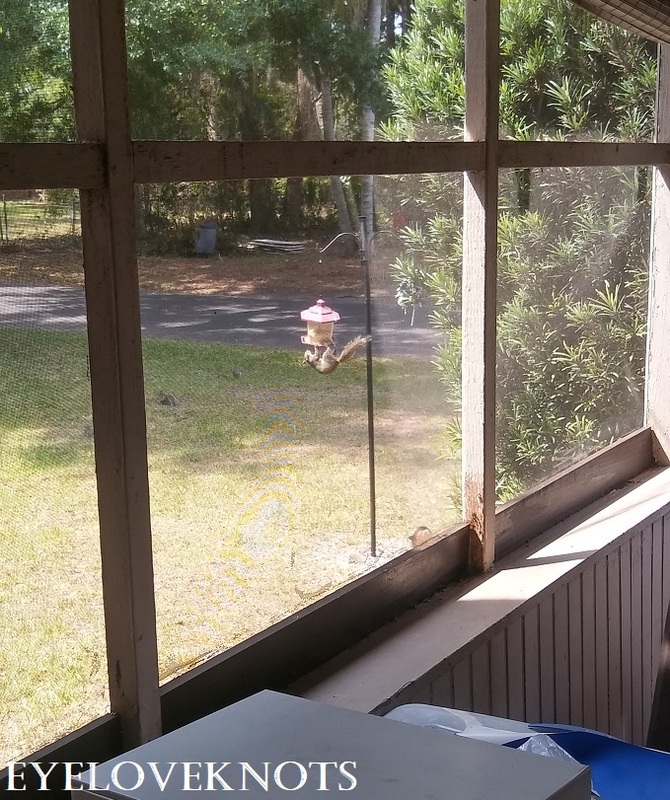 And here you can see what I was talking about – they hang upside down on the bird feeder, crunch up, grab an arm full of food, and then hang upside down again while they eat. Here on my feeder is a sweet male cardinal – the males are the bright red ones. The Doves are on the ground. The birds like to come in pairs – one looks out while the other eats. The male cardinal is on top of the pole, while the female eats. The female cardinals are brown. Here’s the male down on the monkey head. Here is my Blue Jay couple. 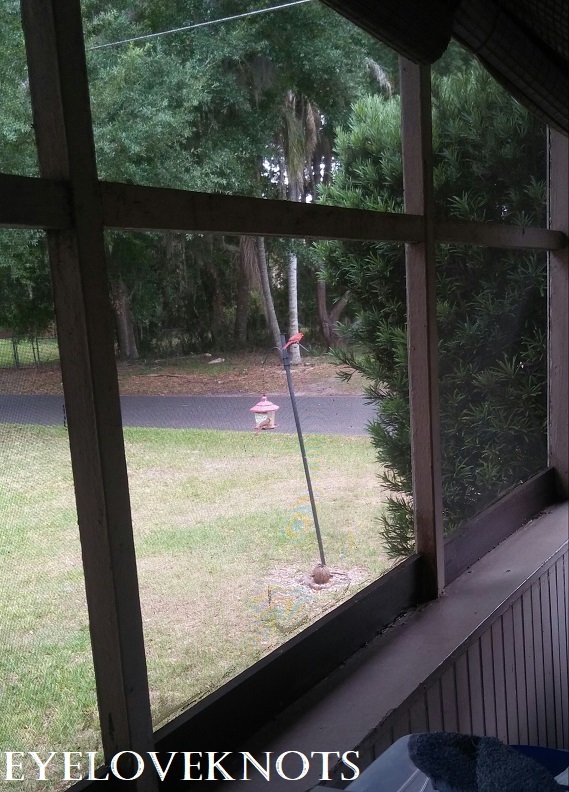 It makes me so happy to walk out onto my porch, and see the birds and squirrels at my feeder. 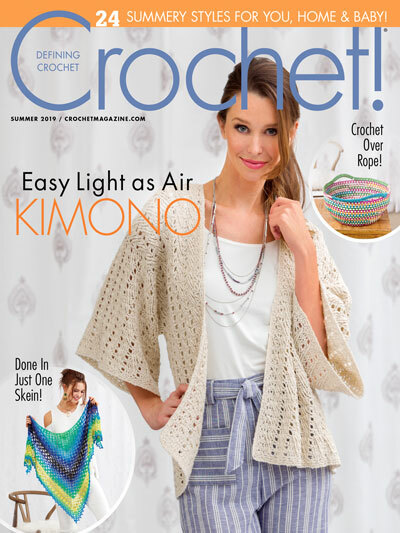 Glad to share with you! Do you have bird questions? Drop me a line! Please feel free to share one of my photos on social media, but DO NOT remove my name. DO NOT re-publish my photos as your own. DO NOT copy and paste anywhere, link to it instead so other’s can come for a visit. That’s so awesome! I wish we had squirrels here! Oh, now I really envy you – and your yard. I live in an apartment and I have a couple of sparrows that come to one of my balconies to tweet every morning. My daughter complains that they wake her up too early in the morning, but I love them and I’m thinking of installing a birdhouse on the balcony. 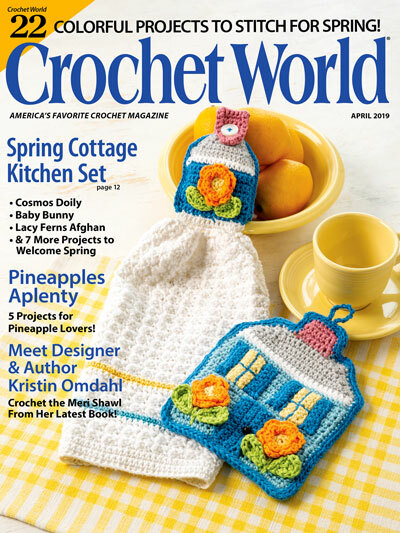 Thank you for joining The Really Crafty Link Party. A birdhouse on the balcony would be nice. Then you could watch all of the sweet little birds that come to visit. I too love the sound of the birds. Growing up I had chickens, and I miss the sound of the rooster crows.